Last night I discovered that I did not make the cut to participate in this year's LALUZAPALOOZA Show. Needless to say, I am crushed, but I do not feel defeated. 8,999 other artists submitted work for the show -of which only 120 were selected. Nothing will stop me from trying again next year. I will not consider this a set-back. I do not view this rejection as a value judgment, in fact, it's just the spur I needed to thrust me into overdrive. . .and PUSH me higher, farther, faster! I am compelled to prove who I am and what I am capable of. The path is finally coming into view. The momentum is building, I can literally feel the ball rolling. . . there is no turning back. This morning, looking for an image for this post, I reached for my old Thesis Journal from Art School (1998) - which I don't think I've touched since then. When I opened it, this is what I found on the first page. The words couldn't ring more true for me at this moment as I struggle to navigate the course ahead. I just added the hourglass to emphasize my determination to make every minute count! 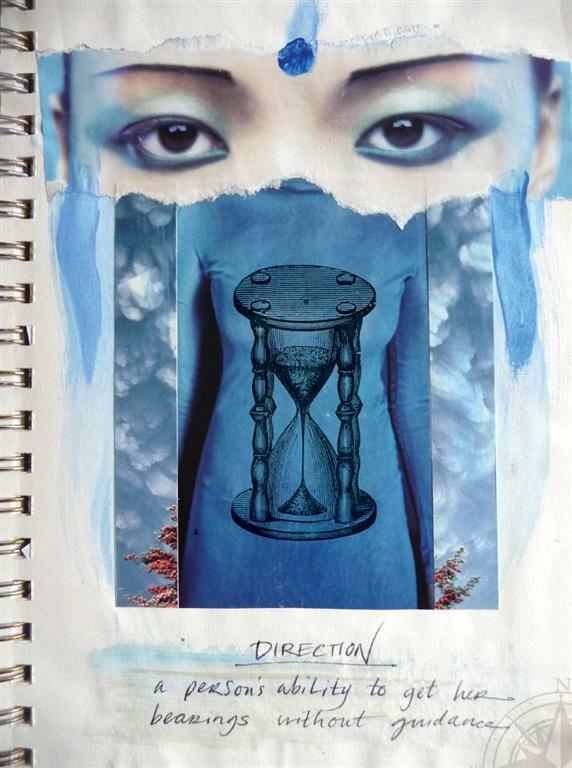 Click HERE to view a few selected pages from the old journal of my senior project. Darn! Sorry your LALUZAPALOOZA submission didn't make the cut. I'm always amazed when I see your work. Alea you are talented. Your painting skills inspire me! P.S. I'm totally writing this Mile's quote on my dry erase board! . . .and you inspire me Alissa, in so many ways! Keep Going! Do NOT get so discouraged that you stop doing ART. Art is our life blood - the real passion - our reason to breathe. YOU are super talented and driven to create and make art, just do it. I love this quote by Gilda Radner:" I can always be distracted by love, but eventually I get horny for my creativity." At the TV place we keep entering the 48hour film race, our 5th try this year, so far we haven't won, or come very close to winning, it is a lot of work, but it is fun, so we keep trying. Alea; I used to plaster my walls with rejection letters from editors and publishing houses that generically (Dear Artist) discarded me. It's all about perseverance (and who you know). It made me stronger and then with time, age and my 9-5 job finally killed me a little. The one thing you do have on your side (cause we all have time and age against us) is no 9-5 job sucking the life out of you! You have this! You do! And so will I. I can't wait to see you tomorrow and exchange energies. We F-ing rock, all around the obstacles...and um...the clock.